I have been hearing for a couple of years now how well Savage Firearms shoot. I recently had an opportunity to try one and am sorry that it isnt mine. A friend from work asked me to help him find a varmint gun for shooting ground hogs and such. His primary concern was accuracy and he wanted to be able to shoot factory ammunition. I gathered some evidence from the various chat-boards on the web to share with him on the success that others were reporting. We looked on the Savage website and decided on the model 12FV. I personally would love to have the 12BVSS-S, but he opted for going with the cheaper of the two. I had Jerry Malin from Malins gun order one for him. In less than a week, it was in and ready to be picked up. The first thing that I did was to check the trigger pull. I had heard how bad these things are, but never had actually tried one. Well it was terrible, creepy, and very heavy pull weight. Jerry offered to smith on the trigger and I encouraged John to get it done right away. The gun was left with Jerry to work on the trigger, and was picked up a few days later. With the factory trigger, Jerry was able to safely reach a 3lb pull and it was a big improvement. There are good aftermarket triggers available for the Savages, but they werent in the budget. I mounted a Tasco Worldclass Target 6-24 power scope in Burris Signature Zee rings on weaver bases. I worked up some loads to try using Winchester 748 powder and 50 grain Hornady V-maxes in Federal cases with Federal match primers. After sighting the rifle in at 50 yards, I moved the target to 100 yards to shoot a group and get the scope sighted in for an inch high at 100 yards. 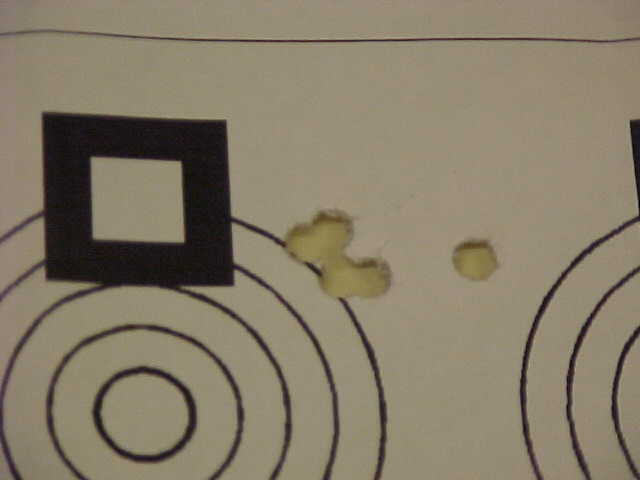 Below is a picture of the first group that I shot at 100 yards. With the flier it measures .76". The four in the group are very tight. This was with the first powder and bullet tried. John had now had the opportunity to shoot the rifle and get comfortable with it. He shot some 3 and 4 shot groups while we made minor scope adjustments and just about every one of his groups were less than an inch, while one of his 3 shot groups was .5". John was not very confident with his shooting ability before he shot the groups. I think that it is safe to say that there are two more Savage believers.